Where is the real power in the USA? Over 169 million shareholders¹ in the United States are the sleeping giant of power. The time has come for the giant to awaken according to former Securities and Exchange Commission Chairman and author Arthur Levitt. “As a group, the millions of American investors could be the most powerful lobby,” he explains. 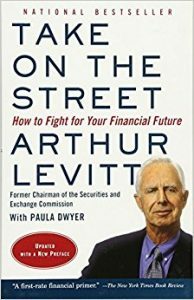 In Take on the Street, Levitt provides the kind of insider information that can help honest, small investors protect themselves from the deliberately confusing ways of Wall Street. But, how right is he? Imagine what would happen if a large body of investors agreed to pressure corporations to stop the addiction to quarterly earnings and actually create sustainable business models that would leave a better world for our children. Maybe we don’t all agree on how to define a better world, but we can all agree that thinking short-term and trying to “beat the estimates” of Wall Street analysts gets in the way of creating long-term security. And you can dream of many more objectives that we can all agree upon. Stop the distraction, awaken the sleeping giant. The information avalanche keeps us operating at a superficial level. We can focus on our world, our country, our futures. As Cal Newport says, do “Deep Work.” Let’s simply discard the barrage, think of what we need, interact, bring it to bear, and see tangible results. Imagine what would happen if all the viewers of CNBC and Bloomberg said, “We want the main thrust of reportage to be accountability for the long-term best interests of all citizens.” Remember the power of the wallet – if the Wall Street firms won’t give us what we want we can fire them. If the media doesn’t give us what we want we can turn it off. Vote with the wallet, make each micro-choice count towards the macro result. We need to be reminded. We are not sheep. Each of us contains the sovereign drive of existence within us. Our DNA, our life force, this is the indestructible force. Couple force with “follow the money” focus, and we immediately have a huge impact. Our impact comes not just by asking questions, but by weighing answers and sharing our ideas and solutions. Asking Questions is the Beginning. There is no rule that says we have to have the answer before we can ask the big question. We simply have to ask the questions, together. Where do we go from here? What can we do that is right? Who represents our best interests? What is the result we deserve? Starting to ask the questions is surely the beginning. The expression “follow the money” is very appropriate. Major questions about policy and human existence are aptly coupled with direct financial information. Since money is the lifeblood of society, it’s incumbent on us to couple financial behavior with policy debate. Otherwise, our discussion is of little consequence. When questions are debated in the context of how money flows, whose hands are on it, and what is the agenda that represents our interests and under what conditions, something magical can happen. Theft happens when nobody’s looking. More eyes on the flow of money can stop deceptive shenanigans before they happen. Each listed company has an annual meeting and shareholders are invited. For example, Catholic Nuns held substantial numbers of shares in Exxon. They got together and realized they had better question Exxon policies. In doing so, they did something that all shareholders should do. They pursued their questions all the way to annual shareholder meetings through Shareholder Actions. They got responses. Absent this type of engagement, the Corporate world can become detached from the guidance of its real owners, and that is often not a pretty scenario. Imagine the scenario when shareholders actually govern their companies, using voting rights. Heading in this direction will solve many problems that have plagued us ever since the rise of corporate power in world affairs. What do you think? Please, rate this article and leave your comments below.